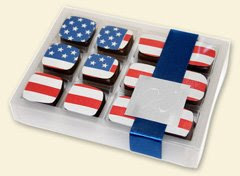 Chocolaterie Wanders has created this nifty box of chocolates to celebrate July 4th. The flag is formed by 12 dark chocolate ganache squares with hints of American whiskey and butter, covered in 70 percent dark chocolate. Chocolaterie Wanders will donate 15 percent of all sales of the Liberty Squares collection to the Pentagon Memorial Fund. Find them online, at Periwinkle in DC and at Cork and Fork in Gainsville, Va.
Do you know if the Bethesda Cork & Fork is open yet?